Ely Methodist is the biggest church in the circuit with a membership of over 100. It is situated in Chapel Street but can also be accessed through one of Ely’s main car parks in St Mary’s Street, where parking is free for up to 2 hours Monday to Saturday and all day on Sunday. Additional unlimited free parking is also available on Saturdays and Sundays at the East Cambridgeshire District Council offices in Nutholt Lane just 200 yards away. 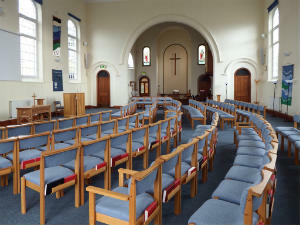 The interior of the church has been completely renovated and the sanctuary has flexibility of use with moveable seating. It has a light and airy feel which adds to its welcome. The highlight of the development is revealed after dark, when the glass panelled doors inset within the old frames reveal the focal point of an illuminated cross to be seen by all those who are passing. Services: 10.30 a.m. and 6.30 p.m.
Every Thursday a Shoppers’ Lunch is served from 12 noon for 12:15 p.m. at a cost of £5.00, to which everyone is welcome. You are invited to any of our activities and are assured of a very warm welcome. For further information on Ely Methodist Church or any events going on there please go to the church website on the Circuit Website where a full list of activities can be found.